Plenty of experienced photographers will capture the magic of the total solar eclipse, so you should just enjoy the once-in-a-lifetime experience, say astronomers. Solar astronomer J. McKim Malville has some advice for people planning to see the Great American Solar Eclipse on Aug. 21: Don’t photograph it. This may seem counterintuitive. After all, a total solar eclipse hasn't crossed the entire continental United States since June 8, 1918. This upcoming eclipse is a once-in-a-lifetime experience. But unless you're an experienced photographer with good equipment, including the specific filters and lenses, and specialized knowledge to capture the moment, don't do it. "I just encourage people not to take their camera," Malville told Live Science. "I really didn't spend very much time looking at the corona," he said, referring to the sun's outer atmosphere, the glow that fringes the blotted-out disk of the sun. This spiky halo of the sun's atmosphere is one of the best parts of an eclipse, he said. It's always there, but under everyday conditions, you can't see it because the brightness of the sun overpowers that halo. But if you're in the path of totality, and you're certain that the moon has completely covered the sun, you can remove your protective eyewear and see the corona for those moments of totality. The ability to gaze at this feature is why people become "eclipse chasers," Malville said. "We have people who are going to every single solar eclipse around the world and have seen 15 or 20 eclipses. 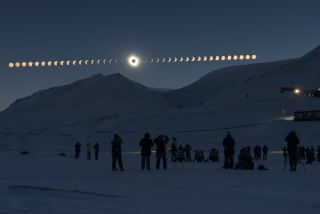 They're going there, not because the sky gets dark, but because of the beauty of the ever-changing shape from eclipse to eclipse of the solar corona," he said. Malville said there are other phenomena to behold, as well. "If you stand under a tree with leaves, each gap between the leaves acts like a projection device and you see on the ground hundreds of shimmering images of the crescent sun appearing beneath you," Malville said. "It's really quite an extraordinary experience." Just before totality, you may also glimpse "shadow bands" in the sky. Those are patterns of light and dark that result from the various densities of air in the upper atmosphere, he said. "It's similar to being at the bottom of the swimming pool, as shadows of light and dark pass over you," he said. Experiencing these phenomena as they occur is more magical than trying to capture them in pixels. "There are things to be appreciated, if you pay attention to everything that is happening around you and not just fiddling with the camera," Malville said. Alan Dyer, an astronomy author and photographer, also recommends that people not photograph the eclipse. But he offers an alternative for capturing the moment. "Put [your] phone camera on video, prop it up, let it run and if nothing else, it will capture the sound," Dyer said. "Everyone else will have photos but only you will have the sounds of you and your family getting excited and screaming! You won't believe you made those sounds. Makes the best souvenir." Dyer, who is about to experience his 16th total solar eclipse, offers extensive advice about viewing the night sky on his blog, AmazingSky.com. The morning after the eclipse, go online. There will be hundreds, and likely thousands of images to view, much better than you could ever hope to take with your own equipment.